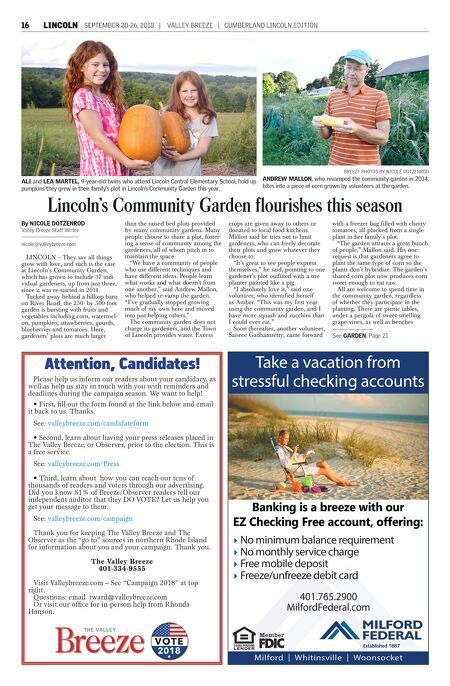 16 LINCOLN SEPTEMBER 20-26, 2018 | VALLEY BREEZE | CUMBERLAND LINCOLN EDITION Lincoln's Community Garden flourishes this season LINCOLN – They say all things grow with love, and such is the case at Lincoln's Community Garden, which has grown to include 37 indi- vidual gardeners, up from just three, since it was re-started in 2014. 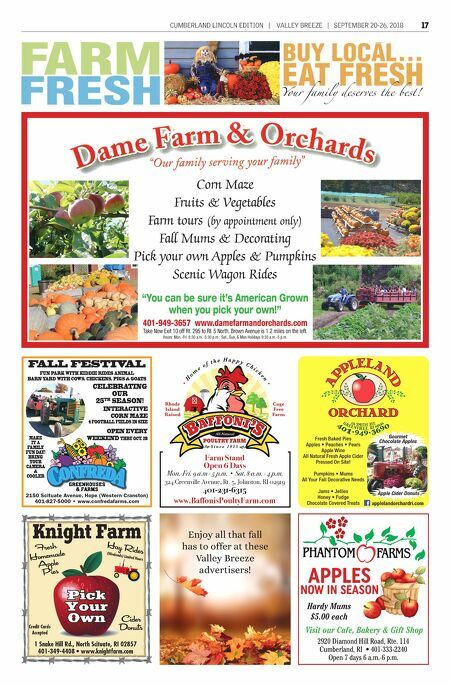 Tucked away behind a hilltop barn on River Road, the 250- by 500-foot garden is bursting with fruits and vegetables including corn, watermel- on, pumpkins, strawberries, gourds, blueberries and tomatoes. Here, gardeners' plots are much larger than the raised bed plots provided by many community gardens. Many people choose to share a plot, foster- ing a sense of community among the gardeners, all of whom pitch in to maintain the space. "We have a community of people who use different techniques and have different ideas. People learn what works and what doesn't from one another," said Andrew Mallon, who helped re-vamp the garden. "I've gradually stopped growing much of my own here and moved into just helping others." The community garden does not charge its gardeners, and the Town of Lincoln provides water. Excess crops are given away to others or donated to local food kitchens. Mallon said he tries not to limit gardeners, who can freely decorate their plots and grow whatever they choose to. "It's great to see people express themselves," he said, pointing to one gardener's plot outfitted with a tire planter painted like a pig. "I absolutely love it," said one volunteer, who identified herself as Amber. "This was my first year using the community garden, and I have more squash and zucchini than I could ever eat." Soon thereafter, another volunteer, Saisree Gadhamsetty, came forward with a freezer bag filled with cherry tomatoes, all plucked from a single plant in her family's plot. "The garden attracts a great bunch of people," Mallon said. His one request is that gardeners agree to plant the same type of corn so the plants don't hybridize. The garden's shared corn plot now produces corn sweet enough to eat raw. All are welcome to spend time in the community garden, regardless of whether they participate in the planting. There are picnic tables, under a pergola of sweet-smelling grape vines, as well as benches By NICOLE DOTZENROD Valley Breeze Staff Writer nicole@valleybreeze.com BREEZE PHOTOS BY NICOLE DOTZENROD ANDREW MALLON, who revamped the community garden in 2014, bites into a piece of corn grown by volunteers at the garden. ALI and LEA MARTEL, 9-year-old twins who attend Lincoln Central Elementary School, hold up pumpkins they grew in their family's plot in Lincoln's Community Garden this year. See GARDEN, Page 21 Please help us inform our readers about your candidacy, as well as help us stay in touch with you with reminders and deadlines during the campaign season. We want to help! s &IRST lLL OUT THE FORM FOUND AT THE LINK BELOW AND EMAIL IT BACK TO US 4HANKS See: valleybreeze.com/candidateform s 3ECOND LEARN ABOUT HAVING YOUR PRESS RELEASES PLACED IN 4HE 6ALLEY "REEZE OR /BSERVER PRIOR TO THE ELECTION 4HIS IS a free service. See: valleybreeze.com/Press s 4HIRD LEARN ABOUT HOW YOU CAN REACH OUR TENS OF thousands of readers and voters through our advertising. $ID YOU KNOW OF "REEZE/BSERVER READERS TELL OUR INDEPENDENT AUDITOR THAT THEY $/ 6/4% ,ET US HELP YOU get your message to them. See: valleybreeze.com/campaign 4HANK YOU FOR KEEPING 4HE 6ALLEY "REEZE AND 4HE /BSERVER AS THE hGO TOv SOURCES IN NORTHERN 2HODE )SLAND FOR INFORMATION ABOUT YOU AND YOUR CAMPAIGN 4HANK YOU The Valley Breeze 401-334-9555 6ISIT 6ALLEYBREEZECOM n 3EE h#AMPAIGN v AT TOP right. Questions: email tward@valleybreeze.com /R VISIT OUR OFlCE FOR INPERSON HELP FROM 2HONDA Hanson. Attention, Candidates!